Although the Neo Geo Pocket only lived a short life between the years of 1998 and 2001 it went through three variants each released in a number of colours. 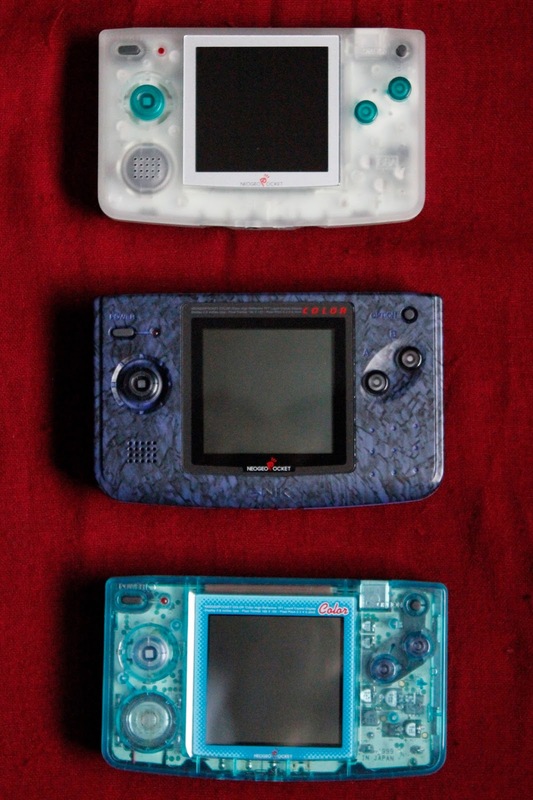 I want to compare these three types of Neo Geo Pocket so that perhaps it may influence your (potential) future purchase. I won't be going into the library of games in this post but suffice it to say I love the console and the short list of games that were released for it. Back in 2000 when I was 12 I got the Neo Geo Pocket Color in the basic silver colour but was always eyeing up the other fancy colours (like the blue camouflage that my brothers had, damn him!). Our family didn't get internet installed until around 2005 so there was no way for me to research the console and so I had no idea there was an incredibly short lived B&W model and a very late Japan only slim model too. 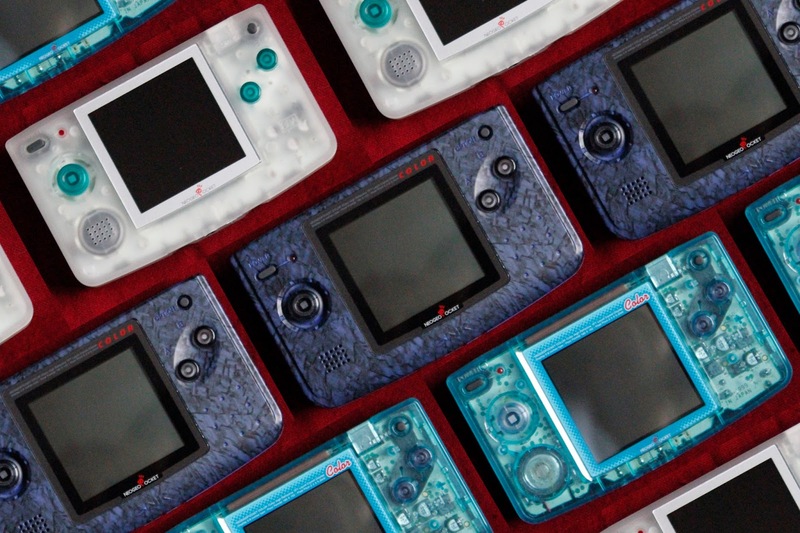 I only ever had three games for the console but loved them up until the point that I broke the console by trying to power it with a mobile phone charger... 15 years have passed and I've gone into a Neo Geo Pocket fever and bought each of the models! Although the console comes in three different variants it's worth quickly talking about compatibility. All systems are region free and most games will switch language depending on the language you select from the system's menu. The B&W model had around 10 games made for it but these can all be played on the colour counterparts. Samurai Shodown! is the only game released as a B&W game that adds colour when played on a 'Color' system; which was a nice surprise! The B&W model can also play around +80% of games that were released for the NGPC (although only in B&W... obviously!). Each console has the exact same layout of buttons and switches, the only difference is the B&W model also has an adjustable contrast level which is controlled via a volume wheel on the bottom; much like the original Game Boy. They each have a microswitch joystick which is incredibly clicky and glorious. They all have A, B, Power and Option buttons, a volume slider and headphone socket on the bottom and an EXT. 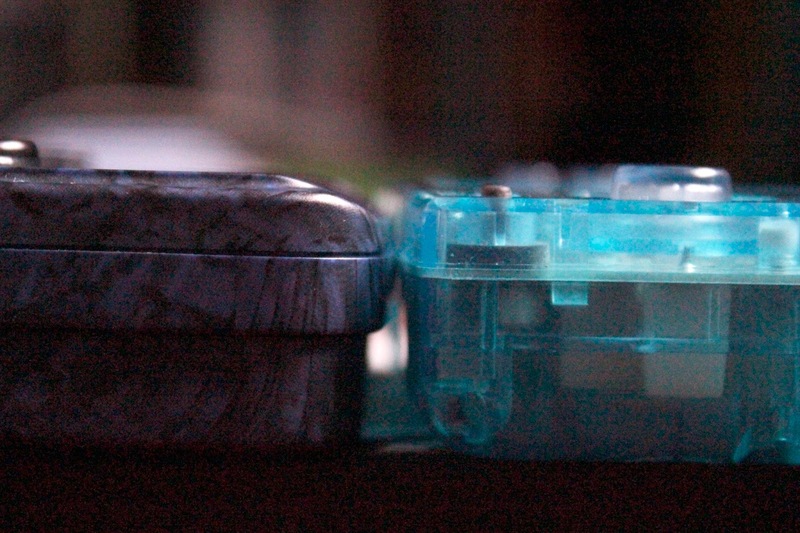 port on the top which was used for connecting systems together for multiplayer games as well as connecting to the Sega Dreamcast. None of the consoles have back or front lit screens. 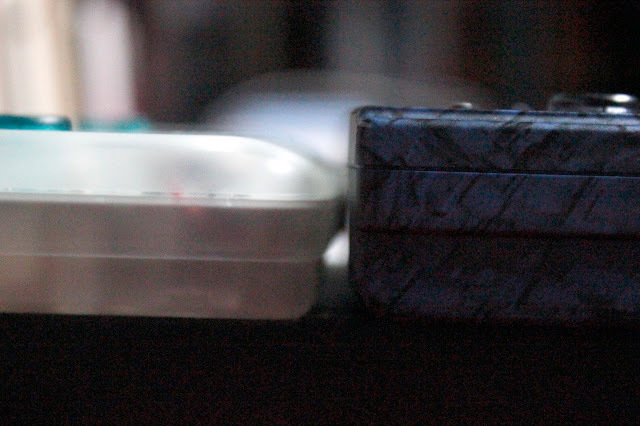 The B&W uses two AAA batteries whereas the later models use two AA batteries. You can get many many hours worth of gaming out of a set of batteries for all models due to the lack of a lit screen. Each also have a 'sub-battery' port which is not essential but is used for saving the system's memory for things such as the date, time, language, what colours to play B&W games etc. It is not used for save data as a lot of people believe. This sub-battery is a CR2032 and was used in a fair few devices at the time. 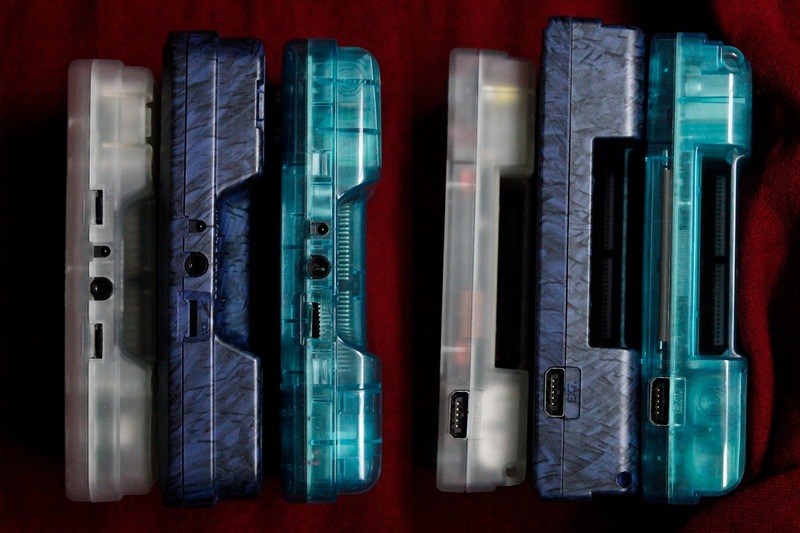 From top to bottom we have a European B&W model in 'Clear', a UK NGPC in 'Stone Blue and a Japanese 'New' NGPC in 'Crystal Blue'. The top box is for the European version of the original B&W model. 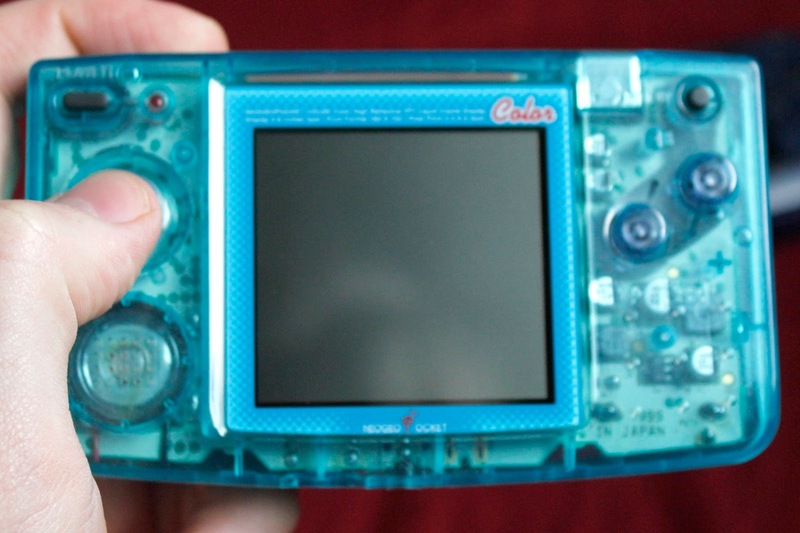 The B&W console didn't get a UK specific version probably because they had already started development of the colour successor in order to compete with Nintendo's just announced Game Boy Color. 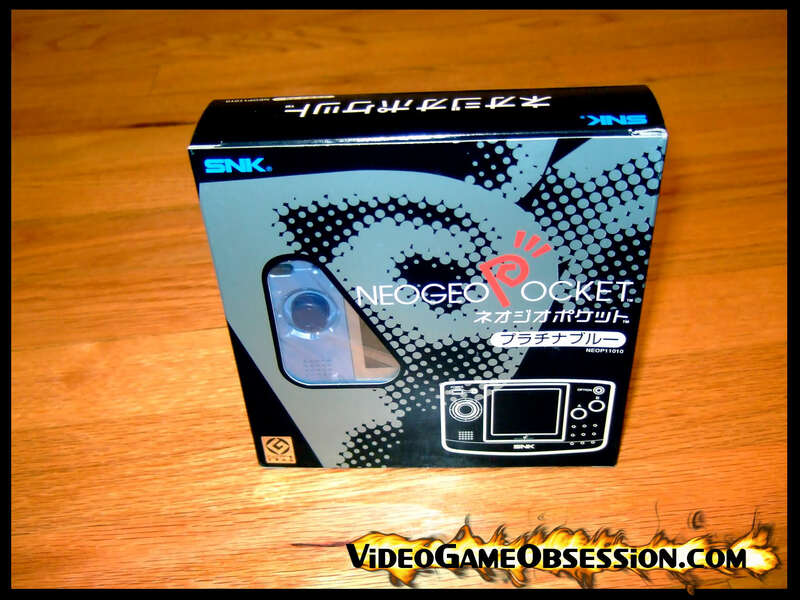 The Japanese version comes in a black box with a window through which you can see the console. When I got this box I was shocked by how small it was, the box is much more compact than the other two and I really like it for that. The box comes with a book of instructions printed in four different languages. 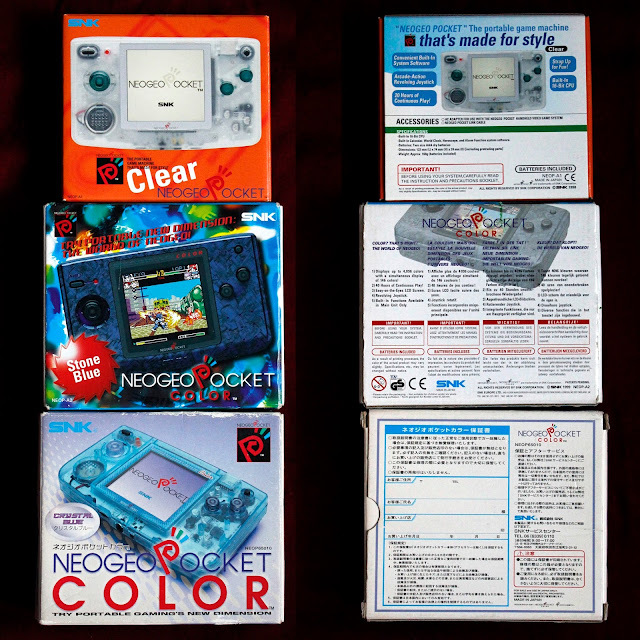 The middle design is the one that I will always associate the most strongly with the identity of the NGPC as it is the design I grew up with but it's really interesting to see how the console was marketed differently for different regions. I like the fact that we actually put gameplay on the packaging (who would have thought!) and the colourful background shouts to me 'I'm cool!'. The European, US and Japanese boxes are not as exciting. The box contains 4 fold out instruction sheets colour coded for each language. The bottom design looks a little boring to me, it looks too serious for what it is! It also has the most boring back out of the bunch. The box comes with a single fold out instruction sheet. I'd love for someone to be able to translate the back of this box, I'm curious what the bullet points are on the top left in particular. From the front they all look fairly similiar although the easiest way to tell them apart is the word 'Color' to the top right of the screen. Obviously it's not there on the B&W version, but the font for the word 'Color' also changes between the regular NGPC and the slim version. Another way to tell them apart is the distance between the power button and the top right corner of the console. On the original NGPC the power button is further inset. 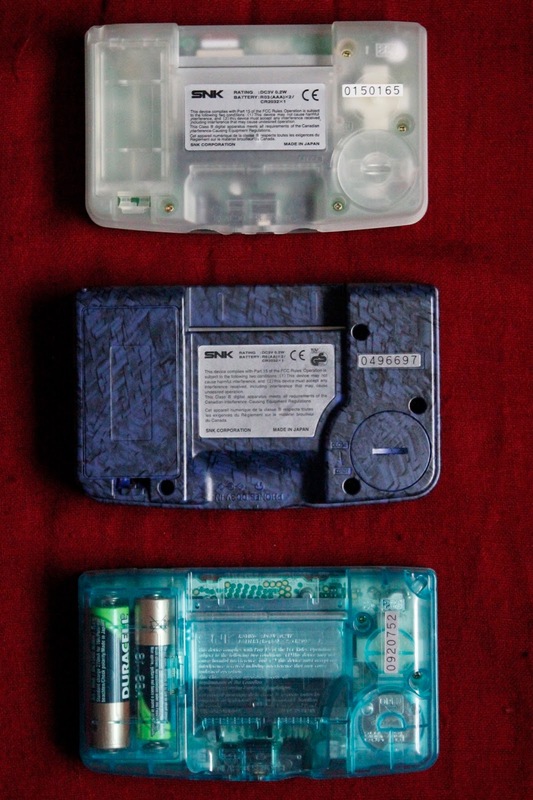 All three versions have the same layout on the back regarding the battery and cart placement although the B&W model has a slimmer battery cover due to it only taking AAA batteries and the slim's battery covers remove differently making it easier to get to the sub-battery. On the slim the battery cover pops off rather than needing to be unscrewed with a coin (pro tip: cover a coin in paper to avoid damaging the plastic of the older versions when changing the sub-battery!). The slim also has the model number going up rather than across the back. The original console is by far the slimmest and all round most compact. The original colour version is the biggest but doesn't feel too big, it fits nicely in the hands. 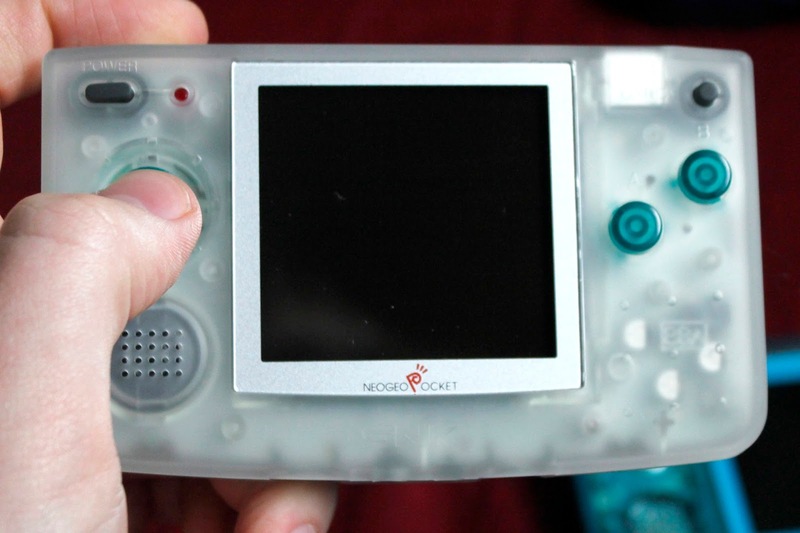 The slim model is noticeably smaller although technically it's only 13% smaller than the regular NGPC. 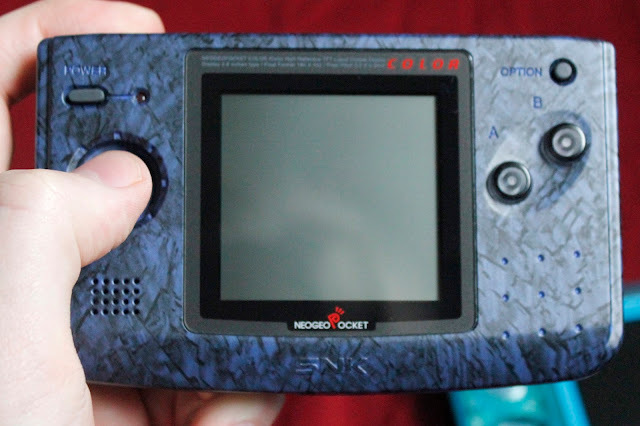 In terms of depth it's around the same as the regular NGPC but it's not as wide or tall so it does appear and feel that little bit more pocket friendly. Although the B&W version is the smallest it has a noticeably different feel in terms of weight when compared to the others. It feels slightly heavier, in particular it feels top heavy. It's not a deal breaker but it does feel a little odd when comparing the feel of each of the consoles. The second heaviest is the orginal 'Color' but again it doesn't feel too heavy. The slim is noticeably lighter and has very good weight distribution. The B&W console features a screen which appears black when turned off but gets 'light' added when powered on. It's unusual to see, it's almost like an inverted Game Boy. 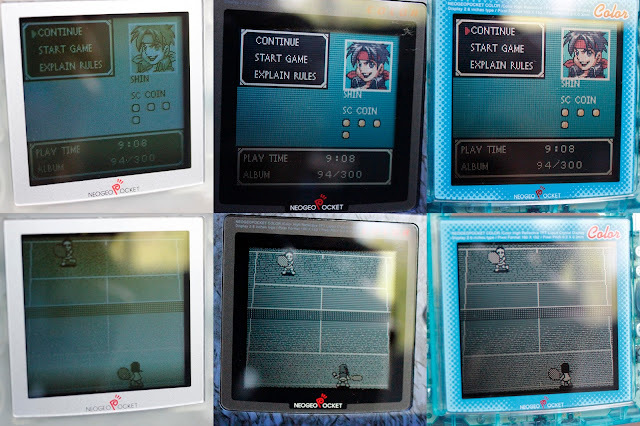 The other two versions appear to have the exact same screen installed. All three screens do not feature a back or front light so the best way to see them is outside, near a window or under heavy artificial lighting. I personally don't have too much a problem with this as modern systems have the reverse problem as you can't see them very well in direct sunlight. These look phenomenal on a bright summer's day and isn't that what these consoles are for; playing on the go? One thing I did notice is the position of the screen got lower and lower with each iteration, not sure why exactly. I like the mid height screen of the original NGPC the best, the slim makes it feel like the screen is trying to run away! Where the B&W version really falls down is the quality of the screen. It's obviously something to do with the technology being used but it is very blurry when there is any movement and even when there isn't the image can appear grainy, none-distinct and not very flattering for these visually great games. If you consider a good portion of the games library is made up of fast past fighting games and then the screen soon becomes a problem. Also, with the B&W console I always feel like I'm having to adjust the contrast as games can vary a lot in terms of brightness and I never seem to be able to find that sweet spot. The screen on the colour consoles is of very high quality with no blurring whatsoever. Everything looks pin sharp and engaging. The B&W version may be smaller but it fails on all other accounts. Games are just a lot more fun to play on the other screens. It's nice to see what games look like on the B&W screen out of curiosity but this is almost always at the cost of the gameplay. Interestingly it appears there are certain games that have a different ROM to be played on a B&W system. For example the game Puzzle Bobble changes from being a colour heavy puzzle game to a pattern heavy puzzle game; instead of having to match 3 colours you have to match 3 patterns which is unusual and much more difficult. The original NGPC is an excellent system that feels great in the hands. The only complaints are that it's bigger than the other two and like the B&W it's easy to scratch or mess up the sub-battery cover when changing that battery. The 'New' slim model improves the battery covers and is slightly smaller than the original NGPC. It feels really nice to hold but has a screen that looks a little too low to me eyes. Like all the other models it comes in a variety of colours but the slim features my three favourite colours of any NGP: Crystal, Crystal Blue and Crystal Yellow. The other models have see-through cover variants but they have a frosted look. I really like the Crystal variety and how much you can see of the inside of the console. Overall I would go for the original NGPC first as it is much better than the B&W and is cheaper and easier to find than the slim. 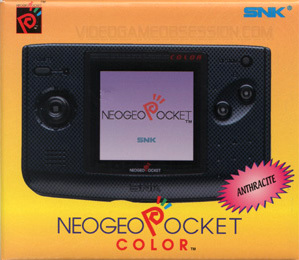 After that I would go for the slim as it is, overall, the best Neo Geo Pocket there is. In last place is the B&W for curiosities sake. Hope this little guide helps, any questions don't hesitate to post in the comments below. is the pocket B&W lens the same size as the slime model lens?